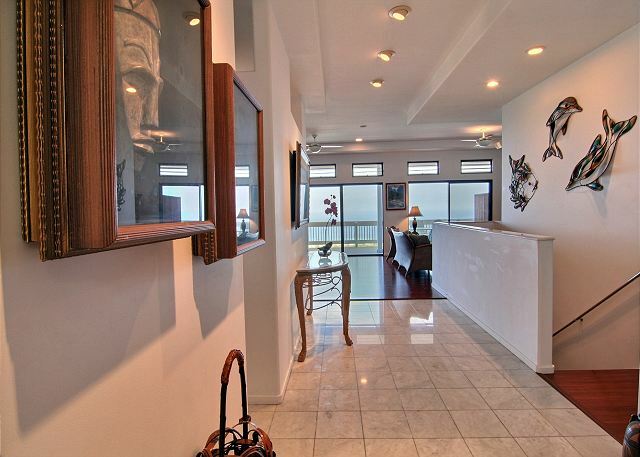 This beautiful home features luxury and artistic touches to add a splash of sophistication to your vacation. The beautiful layout, wood floors and cool tiles fill the house. 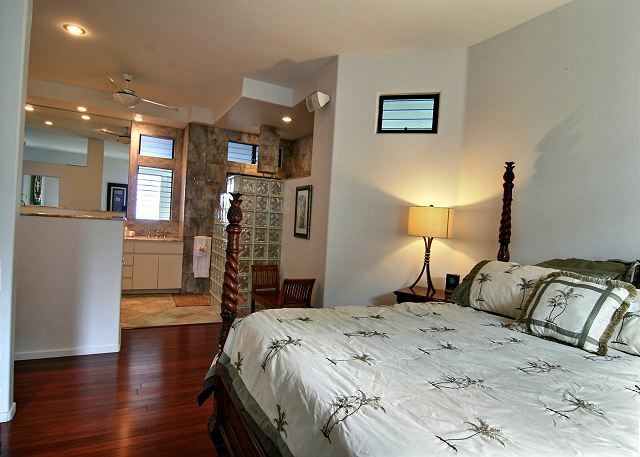 The master bedroom is located on the upper level. 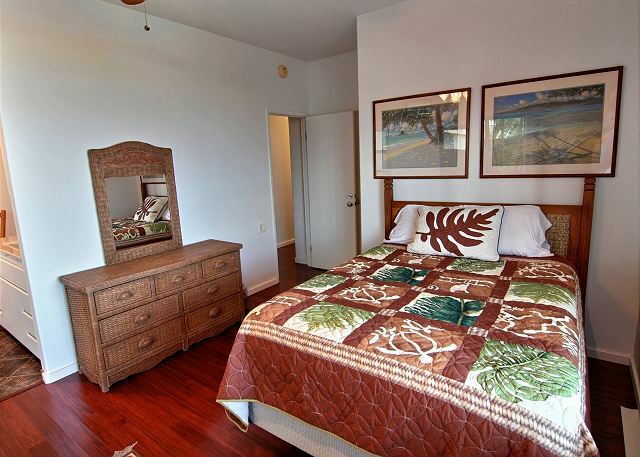 This room includes a California king bed, walk-in closet and very spacious bathroom. The dual-head shower and bench lend to spa-like experience. There is a peekaboo window which includes a privacy curtain which can be opened to view the sunset from the shower. 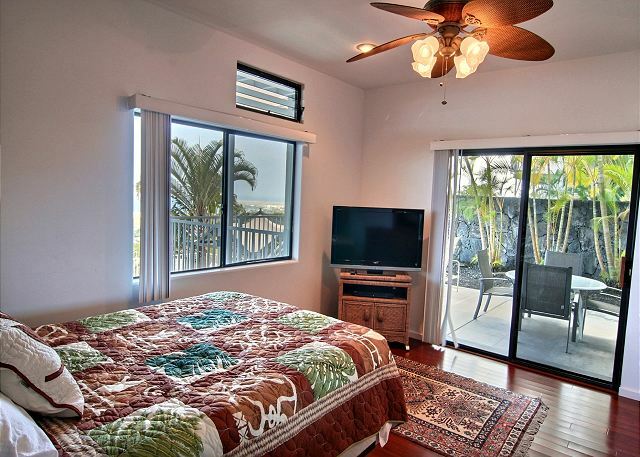 There is also a bonus room upstairs has a twin trundle bed; perfect for kids or single adults! 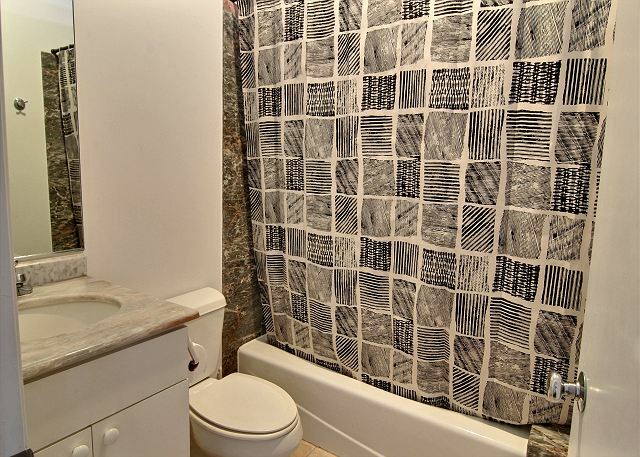 There is a half bath available to be used with this room. 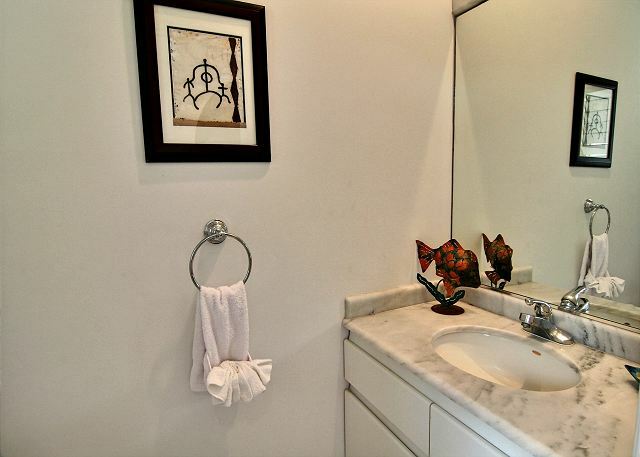 Each of the two guest rooms on the lower levels have their own ensuite bathrooms. 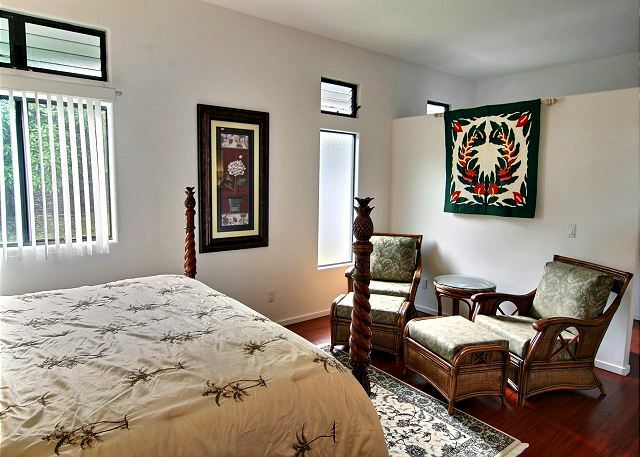 One room includes and indoor bath, outdoor shower, and private outdoor breakfast nook! The fully-equipped kitchen is great from those travelling cooks. The kitchen gadgets make it easy to bring the gourmet experience to your vacation. 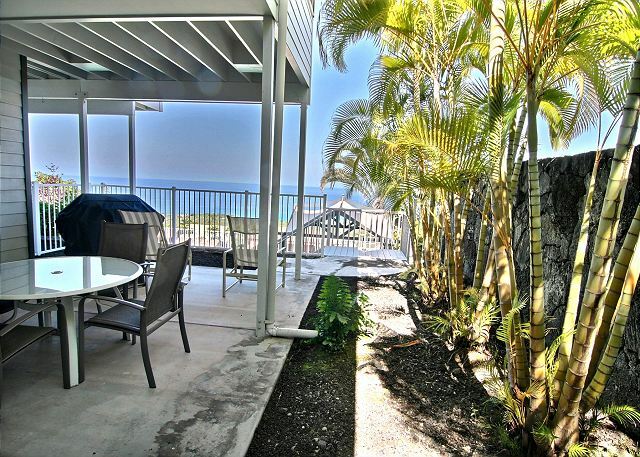 Alternatively, the outdoor grill is perfect for get-togethers or romantic sunset dinners on the upper deck. The coastline view runs from south Ali’i Drive all the way up to the airport. 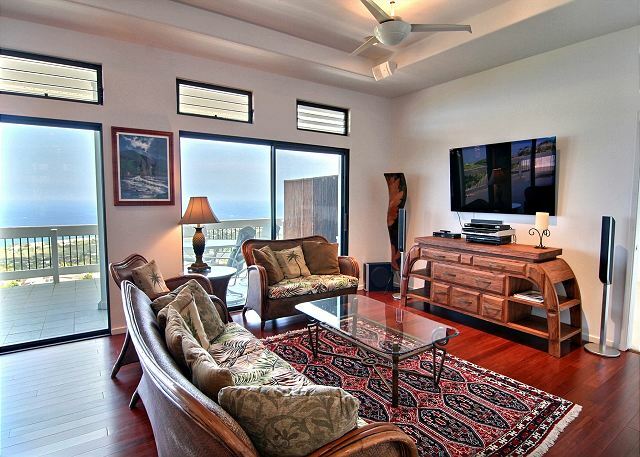 Sit on the upper or lower outdoors spaces for spectacular coastline views from this home located right above Kailua-Kona Village at about a 700 feet elevation. The hillside home offers comfortable cooler night mountain breezes and sunny warm days to jump in the newly plastered pool. 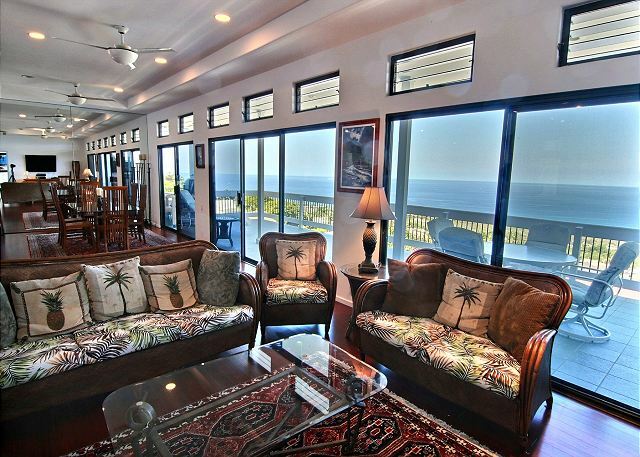 The prevailing trade winds from the west over the ocean and the mountain breezes from the east make this home so comfortable that there is no need for air conditioning. Just a few miles down the shoreline you will find Kahalu’u Beach State Park, famous for its encounters with the graceful green Hawaiian Sea Turtles. The Keauhou Bay area offers great ocean access, scuba diving, and sailing, catamaran, fishing charters, sea kayaking and outrigger canoeing. 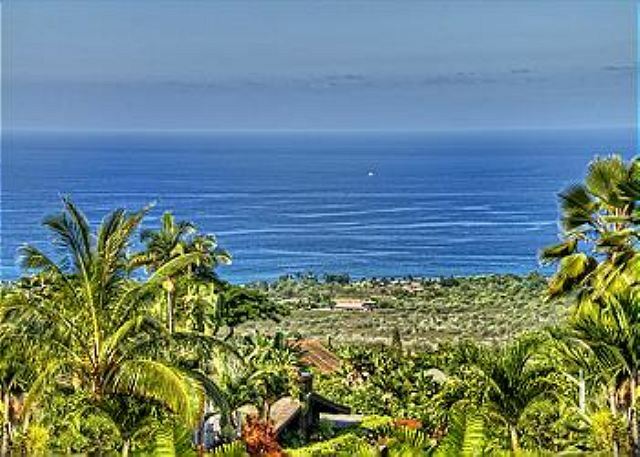 Maluhia is conveniently located, a great home base to explore the many wonders of the Big Island of Hawaii including the Volcano National Park, Mauna Kea Observatory, coffee and macadamia nut farms, artist communities, and more! 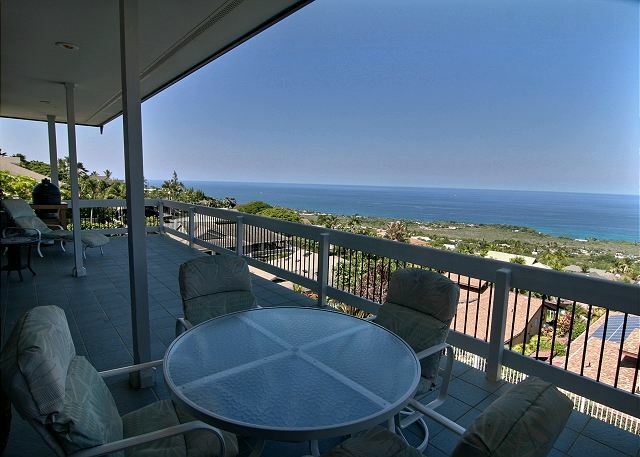 Mahalo nui loa, for your review of Ho'o Maluhia. We hope you return, and please do contact our attentive property manager, Nick, for our repeat visitor rates which are the best you can access. 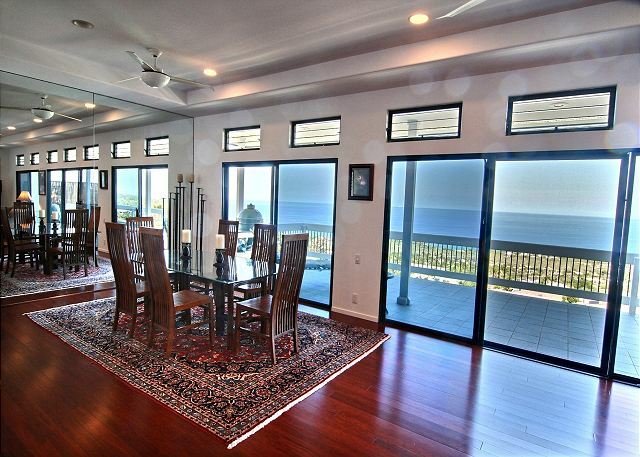 Beautiful home- beautiful view. A few things were broken (lounge chair on balcony). A little disappointing there was only 1 lounge chair on the upstairs lanai where we loved to spend our early mornings drinking coffee. 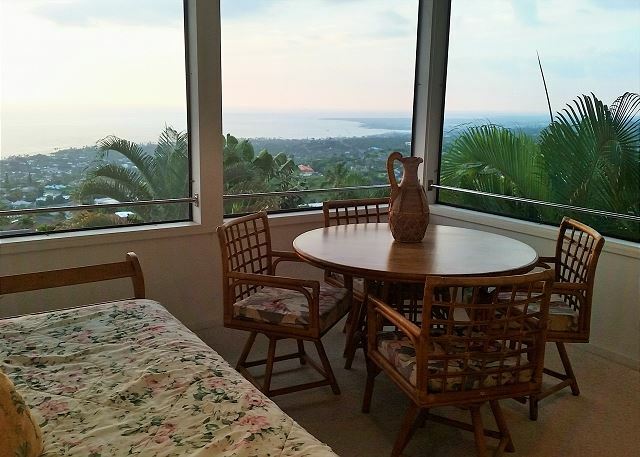 We also thought the view could be enhanced greatly by a plexi-glass fence instead of metal and wood bars on the upstairs lanai. 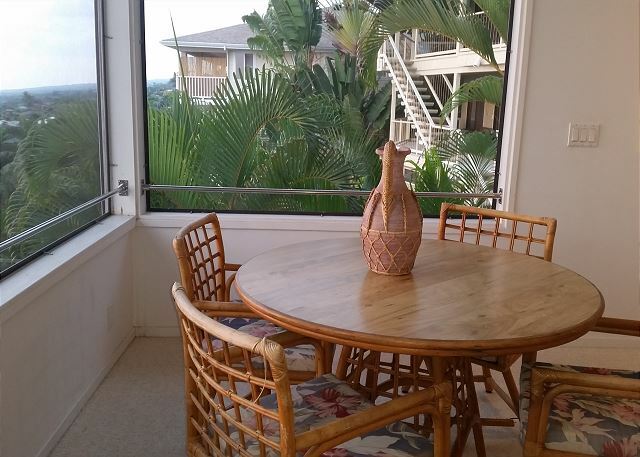 The last condo we stayed in in Hawaii had that type of barrier and made the view so much more enjoyable and unobstructed. It also had a gap that was about 6 inches from the floor. We had a 2 year old with us and it was just enough space to be nerve raking when she played on the lanai. Every time the front door would close the inside handle would fall off (loudly) and need to be placed back on. 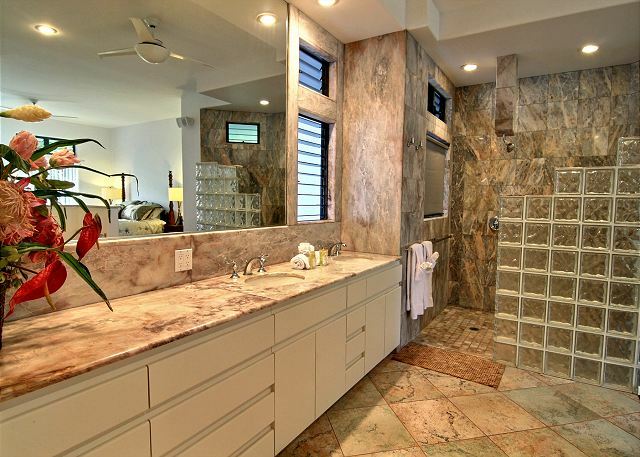 The upstairs bathroom had the most wonderful shower. My husband and I stayed in the spacious upstairs room and loved every aspect of it. My sister in law stayed in one of the bottom rooms and said the shower had a problem draining. The pool and front and back yard were beautifully cared for & had the most beautiful flowers. 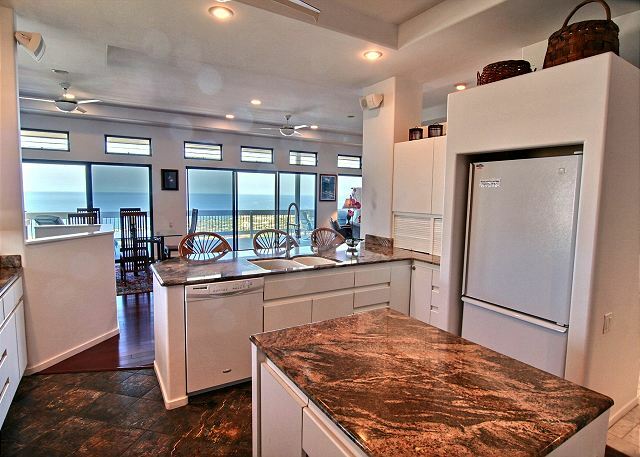 Wonderful kitchen to cook in although we had to buy a sharper knife to make sushi. Thank you for the constructive criticism and recommendations. We intend to address all that was mentioned, and hope you'll return to enjoy the changes! Paula, I am so sorry that the Master Bedroom bed was an issue for you. We recently installed new support slats and fastened everything tightly, unfortunately it seems the efforts weren't successful. We will speak with the owner and recommend replacing the entire bedroom set. Thank you for bringing this to our attention. As for the starter supply of amenities, it varies depending on the property, however in most cases we supply enough to get the guests through the first few days so they aren't forced to rush to the store as soon as they arrive. We appreciate your positive review and would love for you to return! Thank you Fred, we look forward to your imminent return! The initial contact from VRBO sucked. They charged what appears to be a finders fee and when i went to book the rental with the property manager i found out it was in addition to our rental. But that is what i get for not understanding what i signed up for with VRBO. The property was surface clean, but not deep cleaned. I am very picky so no one in my party noticed but me. The furniture coverings are old in the living room. The dining table is uncomfortable, but ok. The master bed was squeaky so every time you moved on it, squeak-squeak that was irritating. The deck furniture is really old and we "broke" a piece on the reclining chair on the upper deck, but it was all rusted. We noticed that many of the other out door furniture was also very old and tired. We also found a couple of chairs that were not in good repair. The property location was outstanding. The pool was the best i have never rented a property with a pool and we loved it! Very nice neighborhood, but the house itself was old, but any major repairs or replacement would drive up the costs of the rental. So there you go! I think some cosmetic updates would be great! The property manager was very nice and we wish we would have called them direct! 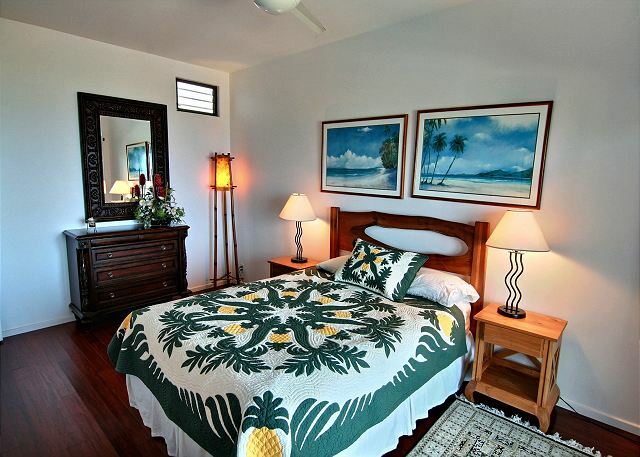 I would recommend this property, i just wouldn't stay in the master suite with the squeaky bed my husband and i were lucky and we were in the downstairs bedroom. 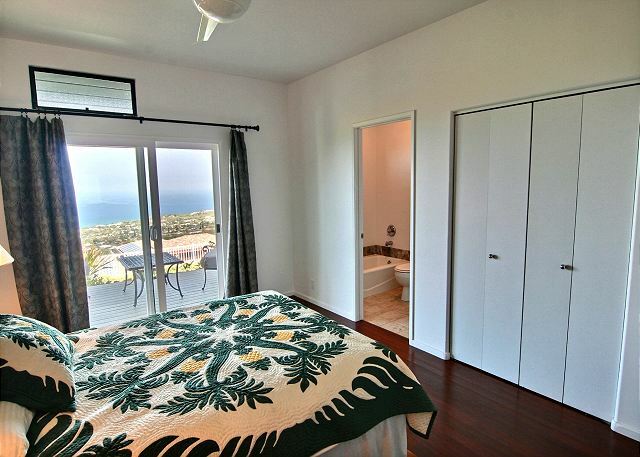 One more thing, the third bedroom only has an outdoor shower. Our other friends loved it, but i was happy to have an indoor shower. Mahalo Millie for the review. 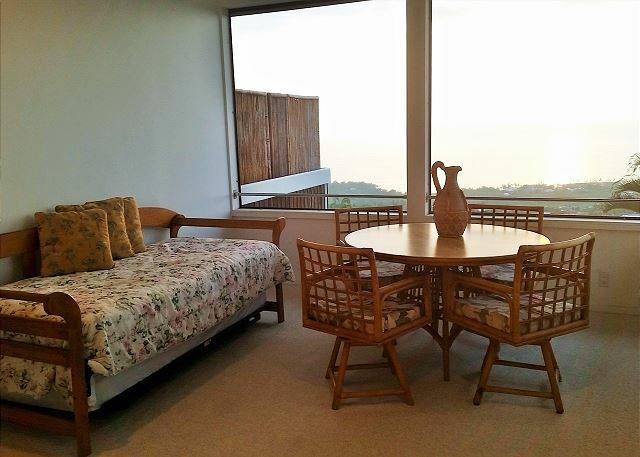 We hope you will remember Boundless Hawaii when booking your next stay on the Big Island! As for the home and areas mentioned. We are making a major effort to address those issues and encourage you to return to see the coming changes! 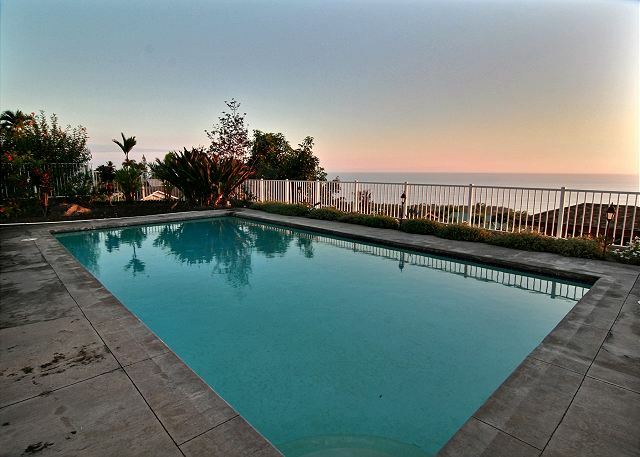 Excellent Location - Wonderful View - Kids loved the pool! Aloha. Thank you for reviewing "Ho'o Maluhia". We are happy that you and your family enjoyed the home. After your report of the carpet in the bonus (kid's) room, we are exploring options for replacement. Aloha and thank you for your wonderful review! You're welcome back anytime, please call our office to book your next trip to Kona. 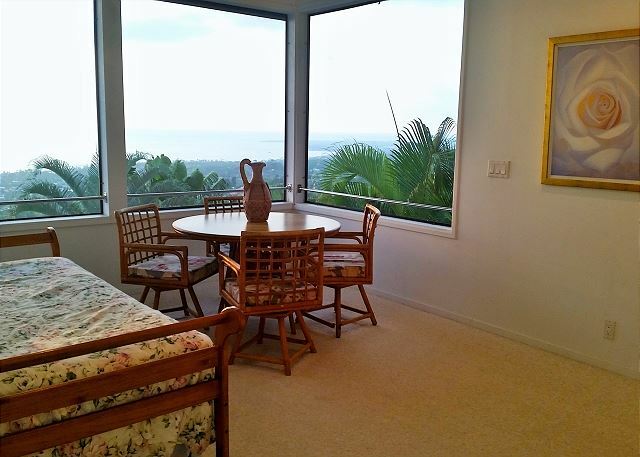 Perfect location with extraordinary views.